Manhattan was beautiful in the dark. I had to go the upper east side go get my friend. there were [garbage] cans afire along the street, not because of vandalism, but for light. People stood in groups and talked to each other. stores kept doors open and were candlelit. [...] calm and serene, not menacing or dangerous. On the other side of the bridge in Brooklyn, people were out in the streets directing traffic and helping in any way they could. It was incredible how everyone just pitched in; black, white, Hispanic, it didn’t matter. It made you proud to be human. A young actress who lives in Greenwich Village was taking a bath when the lights went out. She said that her first thoughts were that ‘we were under attack,’ but that she quickly dismissed such an idea and poured herself a drink. Passengers “sit patiently in near-darkness” at West 4th Street. AP Photo/Jerry Mosey. This all-around chill vibe of the 1965 blackout was hugely different from the infamous blackout of 1977 just 12 years later, which would see looting, arson, and crime reported all over the city. There’s actually been a fair amount of academic study of blackouts. Besides projects like George Mason University’s Blackout Project, there are plenty of sociologists and writers who have wondered about what our reaction to a large-scale power outage say about us. The 1977 blackout did not unleash a spontaneous, liminal moment of unity but revealed a deeply fractured society. The prosperity of 1965 had evaporated, and many New Yorkers believed the energy crisis was a permanent condition... [T]he Blackout of 1977 appeared to be one more breakdown of civic order, as a divided society faced a grim and impoverished future. So why was 1965’s blackout so calm? 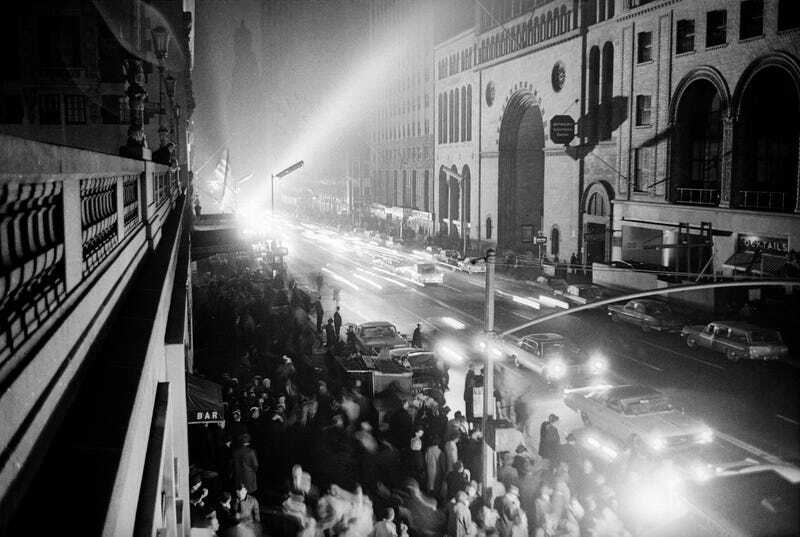 Was it just that nothing like this had ever happened before, and the idea of complete darkness didn’t seem so strange in a city that was still on the upswing of the post-War boom? Were people more naive? Could you even link it to the economic prosperity of New York in the 1960s, versus the blight-ridden city of 1977? Mass blackouts cut us off from just about every technology that makes our world modern. Maybe that’s why sociologists are so interested in studying how we react to them. They seem to be perceived as either setting back the clock 100 years to a more pastoral time, or setting it forward 100 years to some imaginary apocalyptic future where modern civilization has collapsed. Whether a blackout ends up as a party, or a dress rehearsal for the apocalypse, seems to mainly depend on how inhabitants perceive it. The advice of that Greenwich Village actress from the front page of the New York Times in 1965 still rings true today: Relax. And pour yourself a drink.